The TFOS-MGD Workshop Report in 2011 has led to a change of paradigms in the view on the pathophysiology of Dry Eye. There is evidence to suggest that in fact not a primary aqueous deficiency but instead a primary lack of lipids from the Meibomian Glands, due to Meibomian Glands Dysfunction (MGD), appears in fact to be the main primary causative factor for the onset of Dry Eye Disease. This occurs in about four fifths of patients as similarly reported in several studies. The main pathogenetic factors for obstructive Meibomian Gland Dysfunction are an inspissation of the lipid secretum due to increase melting point and a hyperkeratinization of the ductal system and lid margin. ... is to remove the obstruction and release the stasis ... in order to relieve the glands and those secretory Meibocytes that are (still) intact from the internal pressure to give them a chance to heal and re-constitute functional gland tissue as far as possible. Meanwhile there is even an automated simultaneous eye lid warming and expression device available for the clinician that can effectively treat obstructed glands. Physical gland therapy can in selected cases be added by mild anti-inflammatory or antibiotic or by a combined therapy. ... but the immediate question is: "WHAT is adequate temperature ?" "Adequate" means ... WARM enough to re-liquifiy the inspissated lipids ... but NOT too HOT- in order to prevent burning of the tissue of the eye lids and of the cornea. Since the coagulation of protein is typically thought to start over 42°C for liquid egg-white, even though higher temperatures are reported for tissues, the temperature should not much exceed 42°C. at the inner side of the eye lid. it takes even 30min (which would include to replace the warm compress 15 times for a new one !) to reach a maximum inner lower lid temperature of about 40,5°C. BUT ... the warming of the eye lids is labor-intensive and takes time and effort. AUTOMATIC GOOGLES are a great advancement and make Physical MGD Therapy much easier because they control the temperature and do not need replacements. The water source is typically some kind of hydrophilic soaking material that stays moist for one complete use-cycle. The BLEPHASTEAM Googles for automated application of exactly dosed heat together with moisture is probably the most well known type of MGD Googles Image: Courtesy of THEA Pharma.. The googles are more user-friendly and probably particularly advisable to the elderly - who are at the same time the typical age group that appears most affected by MGD at present. 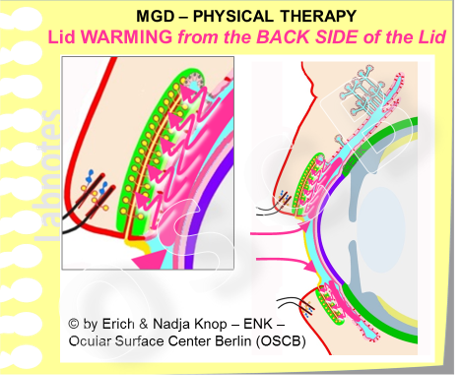 Warming & Heating Googles are certainly more expensive because of the applied technology - but they are less expensive than even a cheap smartphone - so this should be no major hurdle when ocular health is concerned. Manual Meibomian Gland EXPRESSION with the own fingers is possible only to a limited extent and mainly for the lower eye lids as shown here. Expression between thumb and index finger is most effective in the middle of the lid, whereas the nasal and temporal regions are less accessible. Only small amounts of inspissated secretum are expressed here from two orifices in about the middle along the lid. Expression of the Meibomian glands is much easier after lid warming when the lipids inside the glands are re-liquefied. ONE IMPORTANT Reason for some inconvenience is ... that the Meibomian Glands must NEVER be expressed from the outside AGAINST THE EYE BALL (!) ... because this can potentially cause severe wounding to several internal tissues, most likely retinal detachment is a not too theoretical danger, at least in predisposed individuals ! In the clinicians PRACTICE, with appropriate instruments, expression of the eyelids is much easier (please see clinical photos below). Alternatively, a sufficiently stiff Q-Tip-like sponge on a stick or only a sponge is held on the posterior side. By these techniques an effective expression of the Meibomian glands is usually possible. Inspissated secretum, but previously re-liquified, is typically expressed until the glands are completely emptied. Different types of Forceps have recently been developed in order to simplify the expression of the Meibomian Glands. This appears as a favorable innovation that may particularly make the gland expression easier for the MGD patient himself - although a treatment in the practice of the clinician is certainAly more advisable in order to avoid any risk of wounding. Therefore the clinician who had once discovered the condition of obstructive MGD (Prof. Donald KORB from Boston, MA), and who has since then treated so many patients with MGD, has developed an automated technique that is performed by a custom-tailored and computer regulated device. Several peer-reviewed reports from scientific studies have observed an amazing long-term effect after a single Lipiflow procedure. It is reported, that an improvement of objective clinical signs lasts over one year and improvement of subjective symptoms lasts even longer than two years. From these results it may conceivably be concluded that an effective removal of gland obstruction and respective internal pressure from stasis of accumulated lipids may indeed lead to a re-vitalization of remaining secretory cells. LID HYGIENE is typically done with some kind of disposable pad similar to those that are used for removing make-up. In addition some kind of liquid is applied from clean water to special lipid solutions - the use of detergents, however would likely disturb the tear film lipid layer. The more vigorous the hygiene becomes, the more it transforms into a lid SCRUB which needs a certain carefulness in order to avoid wounding. Lid Hygiene is a suitable final step after gland expression in order to remove debris from the lid margin that may be inflammatory or otherwise contaminated. 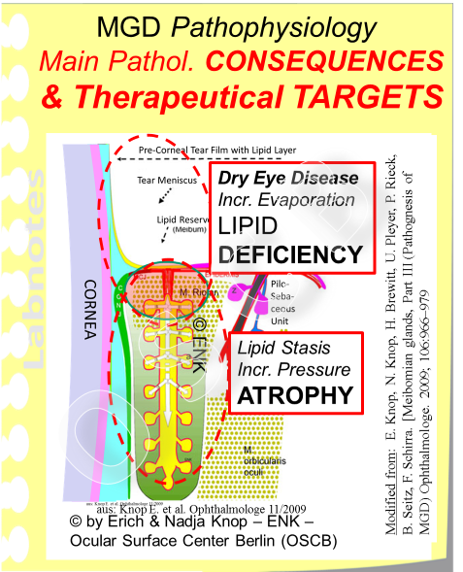 Soaps or detergent solutions may negatively affect lipids in the tear film lipid layer and are thus not very advisable. Clean warm water or physiological saline solution appear better suited - lipid solutions are frequently used comparable to removing make-up together with a suitable pad to clean the lid margin. Often the Lid "HYGIENE" is combined with a gentle massage of the eye lids in order to try to empty glands that are blocked to a minor degree. This works often better when by a gentle lid scrubs lid margin debris, that may be potentially block Meibomian orifices, is already removed. A lid "SCRUB" is more vigorous than just a gently cleaning ... but there is certainly no concrete border line from one to the other. The more vigorous the lid ´scrub´ is performed, at least if this is not done by a well-educated specialist, the higher the risk for any kind of wounding may be estimated. Just repeated careful cleaning of the lid margin twice a day typically has a positive effect on gritty lid margins with obstructed Meibomian glands ... and subsequently on the dry eye condition. There are several commercial sets available for performing lid hygiene. They definitely have the advantage, that everything is right at hands in a suitable and handy way.